Abstract: In the November column, Kerry Hennigan examines the ‘why’ of the life and work of Michael Jackson. Hennigan, Kerry. 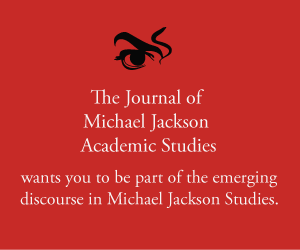 “MJ Studies Today XI (14-11-16).” The Journal of Michael Jackson Academic Studies 3, no. 2 (2016). http://michaeljacksonstudies.org/mjstudiesxi/. Why did Michael Jackson do what he did? And, looking at the broader picture, why did he – just one member of a large, ambitious, musically-oriented family – emerge as the lone, complex genius that he was? And what music it is – ranging from beautiful ballads, thumping dance tracks and humanitarian anthems. Add the performance of those songs in short films and on stage and we have an exceptional body of creative work to examine. In attempting to analyse the ‘why’ of the life and work of Michael Jackson (or any other subject, for that matter) we need to be aware of our expectations from the outset. The closer we look, the more likely we are to see the proof of our respective theories staring us in the face! We think we’ve cracked it! We think we know what Michael was getting at with this song or short film or dance performance. Some of them are unambiguous after all. Others are not. Some involved numerous collaborators who contributed ideas that Michael took on board and incorporated into his vision for the work. With respect to the work of an artist whose output has such a variety of depth and meaning, we can never know the full story behind a piece without having walked around in the shoes of the artist himself. We can never know definitively what was inside Michael’s head – and heart – beyond what he might have shared publicly. For every individual who studies and expresses an original opinion on the life and work of Michael Jackson, there are as many different theories and ideas of what it (and he) was all about. Seven years after his passing, he’s still doing that. ‘Human Nature’ Words and music by Steve Porcaro and John Bettis. https://youtu.be/NrII-bhwtoo Brad Buxer 2014, at approx. 4.43m. The author’s unpublished notes from ‘In the Studio with Michael Jackson’ at Thriller Villa, Las Vegas, October 2015. Kerry Hennigan is a global pilgrim, who combines her life-long love of travel with her love for Michael Jackson. She works full time in Local Government in her home town in Australia, and her current research focuses are Ancient History, Archaeology and Anthropology. She produces the monthly newsletter, ‘A Candle for Michael’, and runs a widely-subscribed Facebook group, Michael Jackson’s Short Film ‘Ghosts. Find out more about Kerry here. Check out more of our wonderful academic columns here.